The redesigned 2018 Expedition, which Ford unveiled this year, will continue to share the 3.5-litre V-6 with the F-150. Ford Motor Co. has increased the power and cut the weight of two of its largest nameplates -- the F-150 pickup and Expedition SUV -- due, in part, to more efficient transmissions and lighter aluminum bodies. Ford of Canada announced specifications for both vehicles Friday, a day after U.S. details were made public in Detroit. The freshened F-150 will feature a new entry-level 3.3-litre V-6 with a six-speed transmission. It will get 290 hp at 6,500 rpm and 265 pounds-feet of torque at 4,000 rpm, the automaker said. Ford is also updating its 2.7-litre EcoBoost, 3.5-litre EcoBoost and 5.0-litre V-8 engines, and is pairing its 10-speed transmission with all three. Since its release late last year, the 10-speed has been available only with the 3.5-litre. The 2.7-litre EcoBoost will get 325 hp at 5,000 rpm, the same amount of horsepower as the outgoing model. It will get 400 pounds-feet of torque at 2,750 rpm, which is 25 more pounds-feet than the 2017 model. The 5.0-litre V-8 will get 395 hp at 5,750 rpm (10 more than the 2017 model) and 400 pounds-feet of torque at 3,850 rpm (13 more than the 2017 model). There are no changes to the 3.5-litre EcoBoost V-6 or the 3.5-litre high-output EcoBoost, which is used in the Raptor. The 2018 F-150 will also feature a 3.0-litre PowerStroke diesel engine option, although Ford did not provide power figures for it on Thursday. The diesel, a variant of the Lion diesel engine that Ford builds for use in Land Rover and Jaguar vehicles, will be produced in England and go on sale in the summer of 2018. Ford's F-Series has been the best-selling pickup in Canada for 51 consecutive years and in 2016 it was the best-selling vehicle in Canada for the seventh consecutive year. 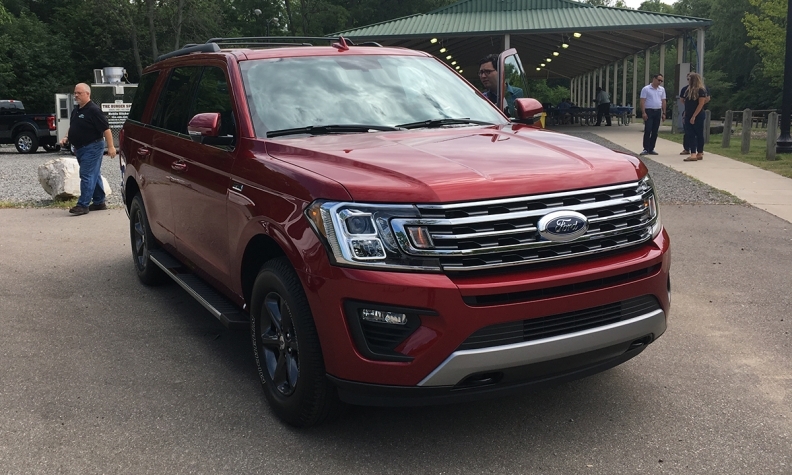 The redesigned 2018 Expedition, which Ford unveiled this year, will continue to share the 3.5-litre V-6 with the F-150 and will now pair it with Ford's 10-speed transmission. It also adds an aluminum body that shed 300 pounds.